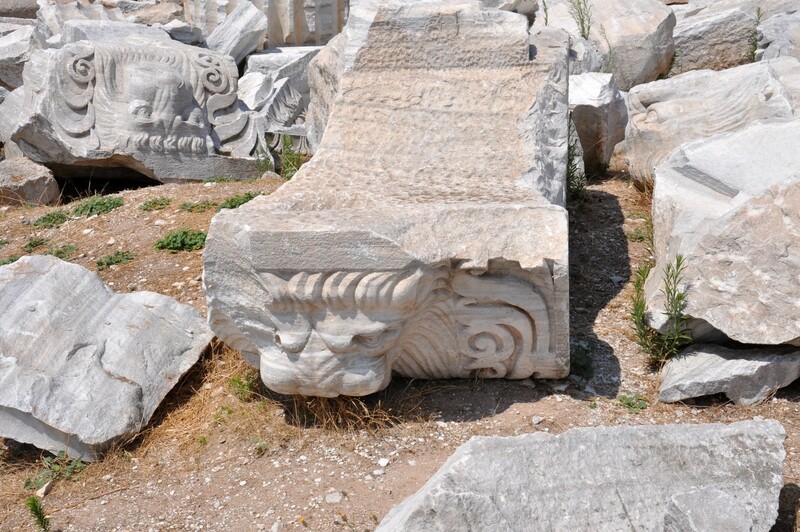 Cyzicus ancient city had been founded by the settlers from Miletus and was one of the oldest Ionian colonies on the coast of the Sea of Marmara. Once a magnificient temple of Hadrian stood there which was perceived as one of the Seven Wonders of the World in the times of late Roman Empire. Now, the ruins of Cyzicus are rarely visited by tourists and the remains of ancient structures are heavily overgrown and inhabited mainly by bat colonies. Cyzicus is distinguished by its unusual location, on the narrow strip of land (i.e. tombolo) that connects the mainland with the coastal island. 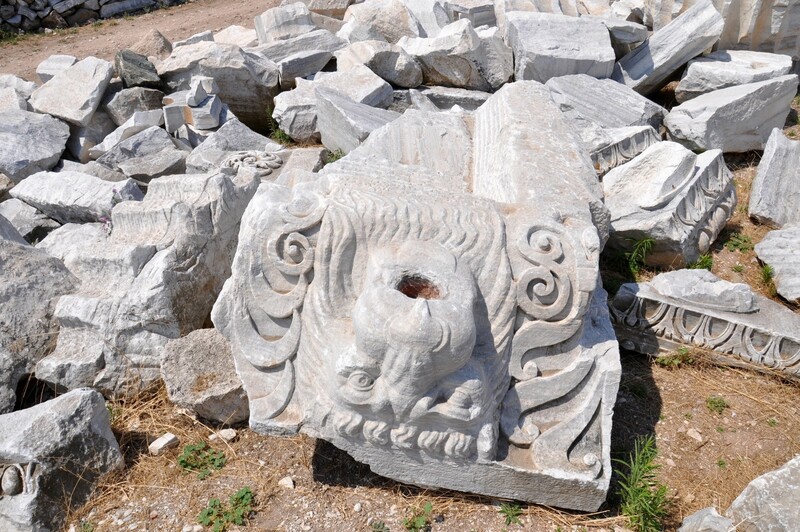 In the case of Cyzicus this tombolo links the continental part of the coast near Bandırma city with the former island of Arctonnesus which is now called the Kapıdağ Peninsula. Legendary beginnings of Cyzicus are related with the arrival of the Argonauts - a team of heroes in Greek mythology, who in the years before the Trojan War, accompanied Jason to Colchis in his quest to find the Golden Fleece. Cyzicus, who was the son of king Aineus, the founder of the city, was killed by one of the Argonauts. 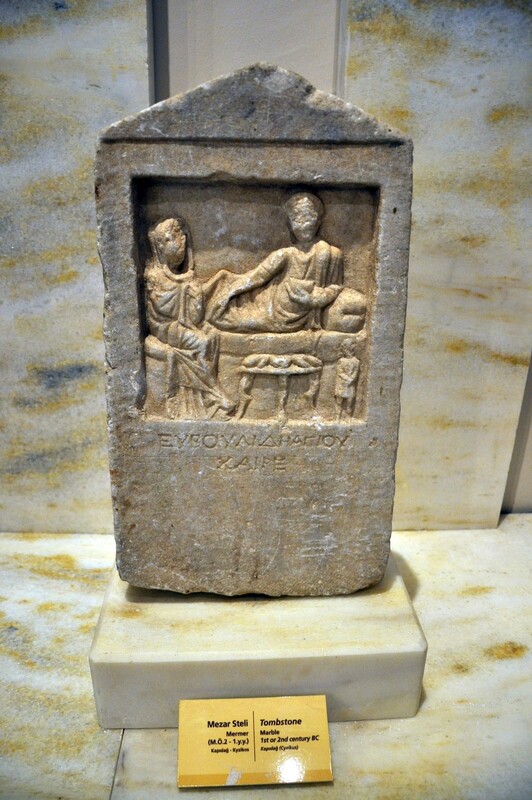 In the ancient era Cyzicus was said to have been founded by Pelasgians from Thessaly, i.e. the indigenous inhabitants of the Aegean Sea region, now identified with Neolithic culture. 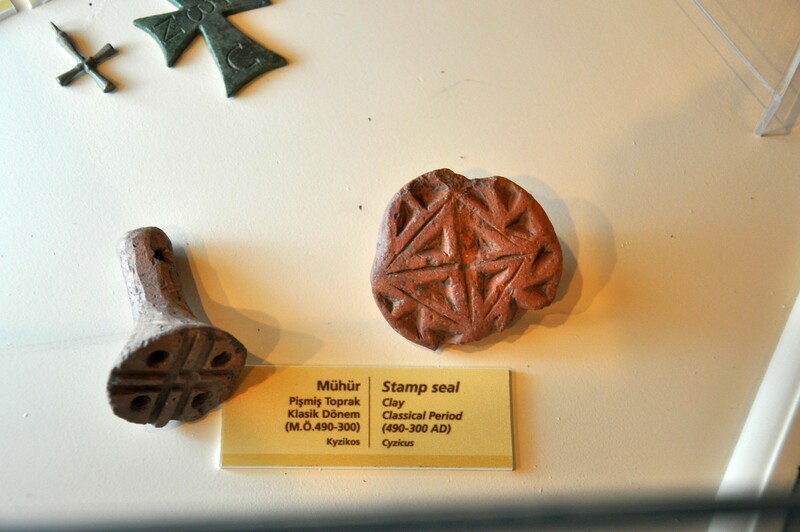 The pottery fragments from late geometric period, found in the area of Cyzicus, that belong to the oldest settlement layer, confirm the existence of the city in the beginning of the 7th century BC. During the Peloponnesian War (431-404 BC) Cyzicus was the subject of Athenians and Lacedaemonians conquests. In 410 BC the great naval battle took place near the city. As the result the Athenian fleet with the help from its allies completely destroyed the Spartan naval power. The golden era of Cyzicus came after the Peloponnesian War, ie. from the beginning of the 4th century BC. Then, as the result of the prolonged wars, the military power of Athens and Miletus was diminished. Formally, from 387 BC Cyzicus was under Persian control and in 334 BC it was conquered by the Macedonian army led by Alexander the Great. As the confirmation of Cyzicus importance in the ancient world one can mention that the golden coins minted there (called cyzicenus) were accepted as the basic currency unit in the Mediterranean Sea region. In Hellenistic times Cyzicus was controlled by the Kingdom of Pergamon. 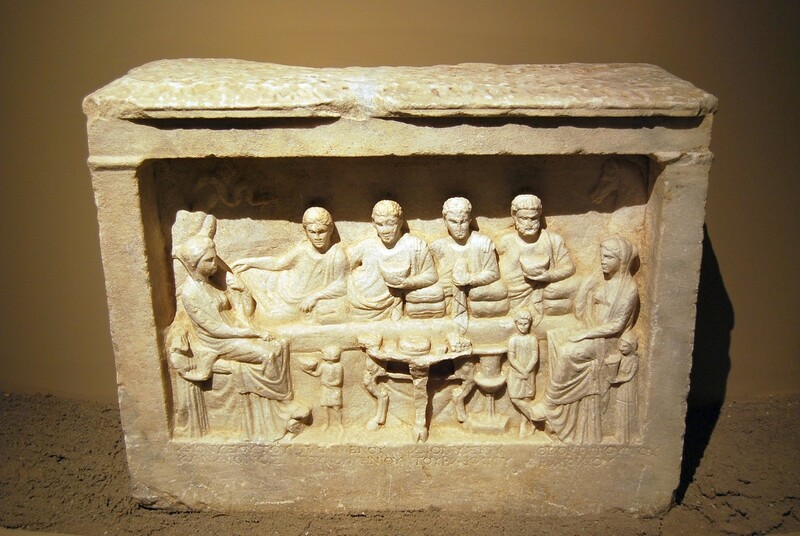 After the death of the last king of Pergamon, Cyzicus became the part of the Roman world. In 73 BC the city, as an ally of Rome, was besieged by the army of the king Mithridates VI of Pontus. The city withstood the prolonged siege, although the Pontic army numbered 300 thousand soldiers. The Roman help arrived in time to save the city: consul Lucullus won a victory over Mithridates and liberated Cyzicus. As the reward for the heroic defense the city received numerous priviledges and the control over the area of northern Mysia as far as Troas. 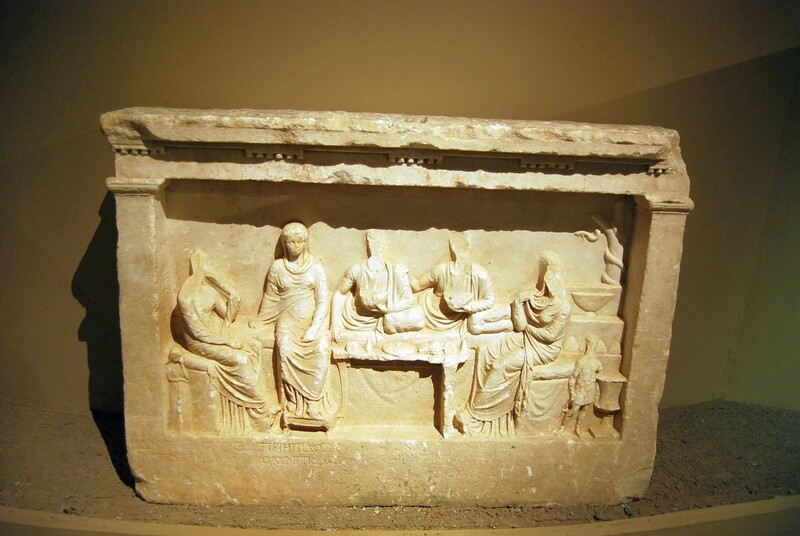 During the Greek and Roman periods Cyzicus was an important center of artistic activities. In the Roman Empire era the temple dedicated to Hadrian was erected in the city. This Roman emperor who reign in the years 117-138 BC was included in the Greek pantheon as the 13th Olympian god. The gradual decline of Cyzicus was caused by the series of catastrophic earthquakes that lasted from 443 to 1063 AD. The temporary conquest by Arabs in 674 AD also contributed to the downfall of the city's power. 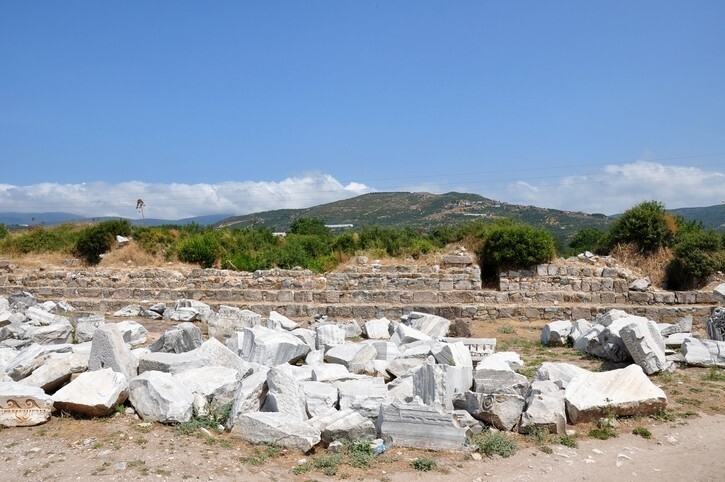 In 11 th century AD the city was half abandoned and its last inhabitants left Cyzicus in the 13th centruy, when the Kapıdağ Peninsula was occupied by the crusaders. In 1431 the ruins of Cyzicus were visited by Cyriacus of Ancona, an Italian traveler and antiquarian as well as a merchant. During his journeys he visited Anatolia, Egypt, Dalmatia and the Aegean islands. He described his archaeological discoveries in the travel journal Commentaria which was illustrated by numerous sketches. For this reason he is often called 'the father of archaeology'. During his stay in Cyzicus he created the detailed illustrations for the temple of Hadrian that was still standing at this time. Because of these sketches the archaeologists were later able to recognize the fragment of the temple among the ruins. 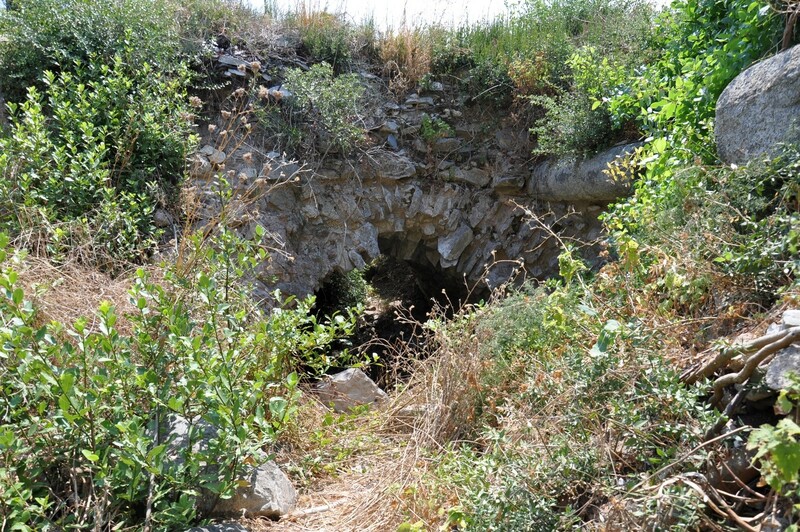 The systematic excavations in the Cyzicus area were started by professor Ekrem Akurgal in the years 1952-1953. He was also responsible for the discovery of the Daskyleion ruins. 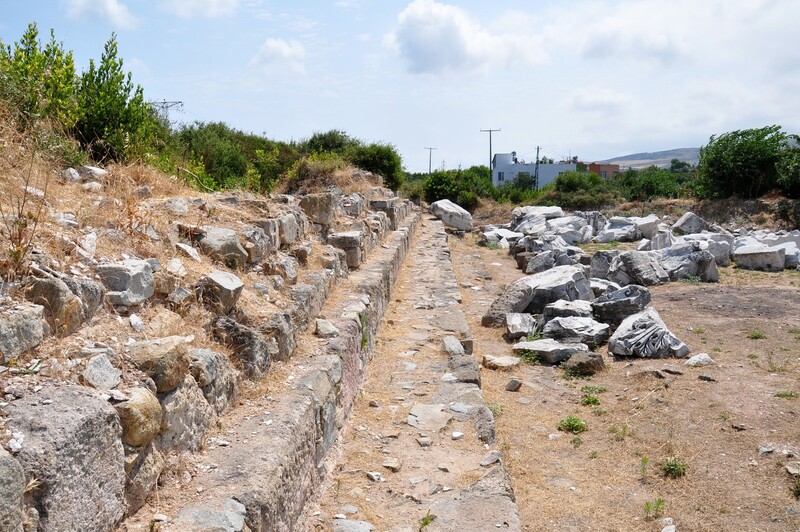 This city, situated 42 km to the south, was governed from Cyzicos in Hellenistic period. In the years 1989-1999 the second round of Cyzicus excavations took place, this time overseen by professor Abdullah Yaylalı. 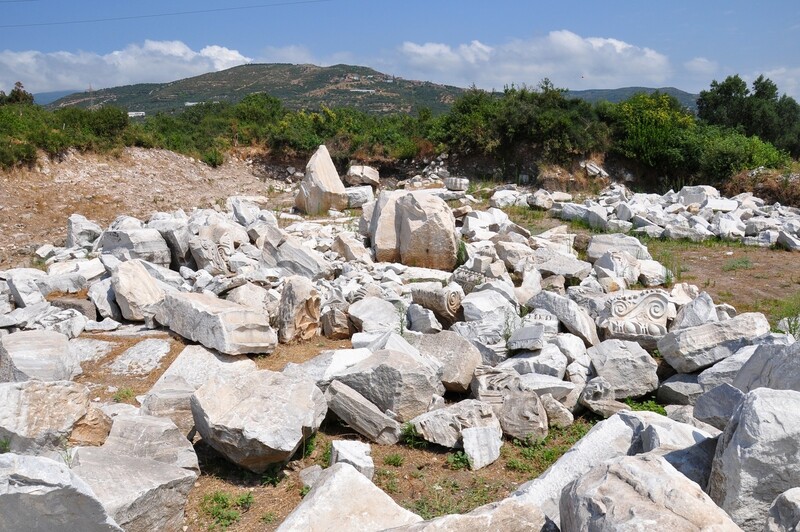 The current archaeological excavations started in 2009. They are directed by professor Nurettin Koçhan from Atatürk University in Erzurum. The main goal of his work is the exposure of the remains of the temple of Hadrian and of three antique harbors of the city. The findings from Cyzicus (e.g. 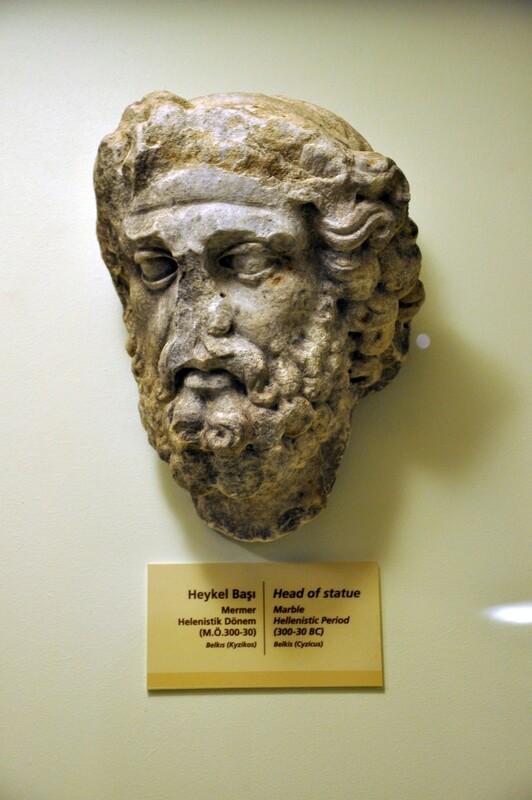 the bust of the male and the relief depicting the dancer and two young man) are displayed in the Archaeological Museum in Istanbul, in the hall dedicated to the archaic art. 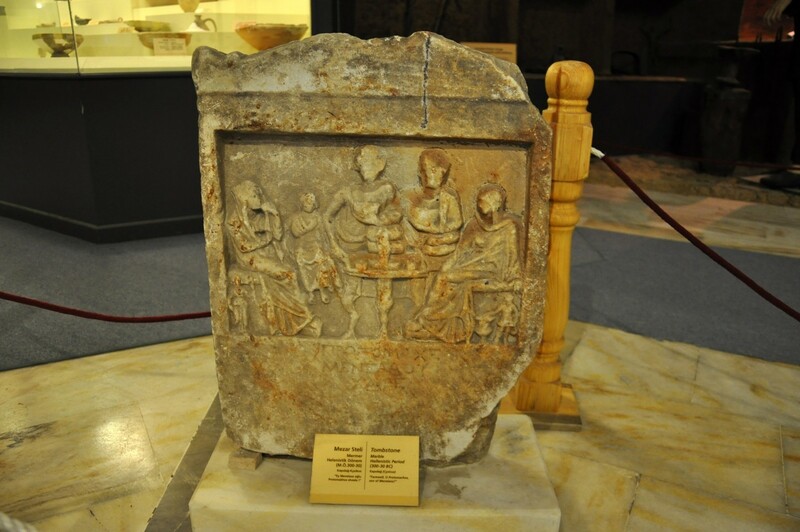 Many exhibits from Cyzicus are also on display in Bandırma Museum. From the colossal temple dedicated to the Emperor Hadrian only some foundations are still visible. 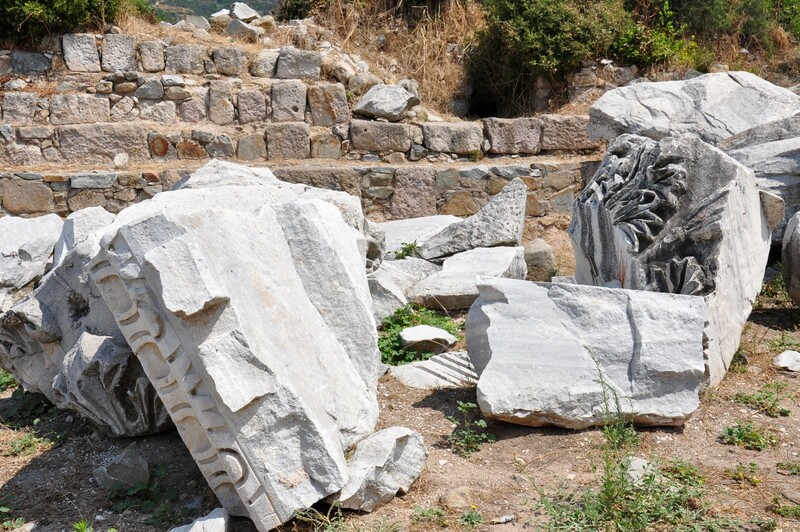 Unfortunately, its columns that were 21.35 meters high, collapsed. While they were still standing they were the highest columns in the ancient world with those at Baalbek (Syria) on the second place (only 19.35 metres high). Moreover, the fragment of city walls from the 4th century BC, the remains of a large amphitheatre (150 meters in diameter) from the 3rd century BC and the Roman aqueduct can be seen in Cyzicus today. 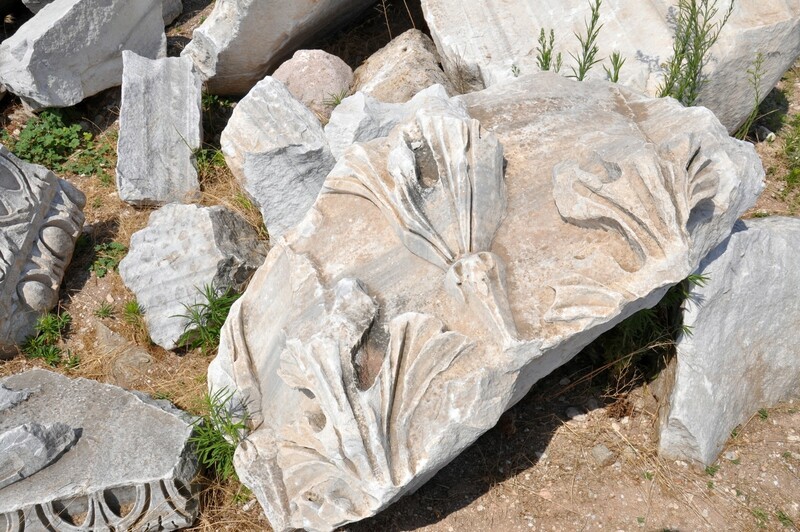 The poor state of preservation of the monuments of Cyzicus results from the fact that the Byzantine emperor Justinian used the place as a quarry for the building of Saint Sophia cathedral in Constantinopole. 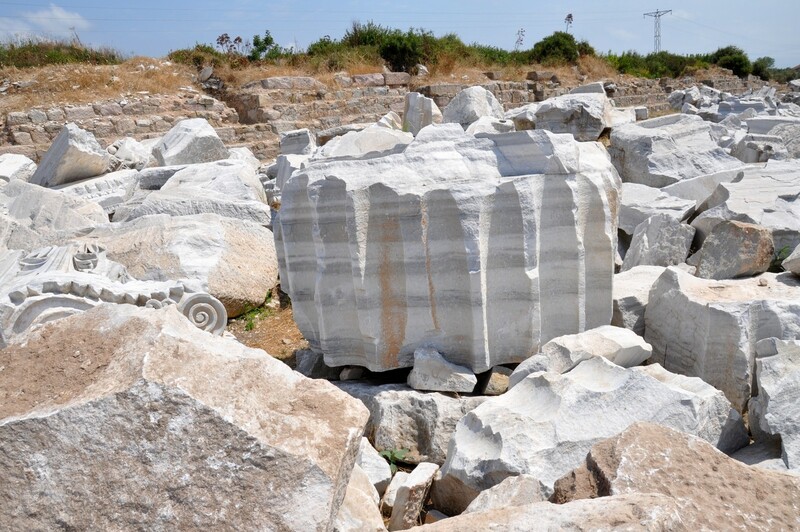 Later, the Ottomans continued this tradition of quarrying among the ruins of Cyzicus. 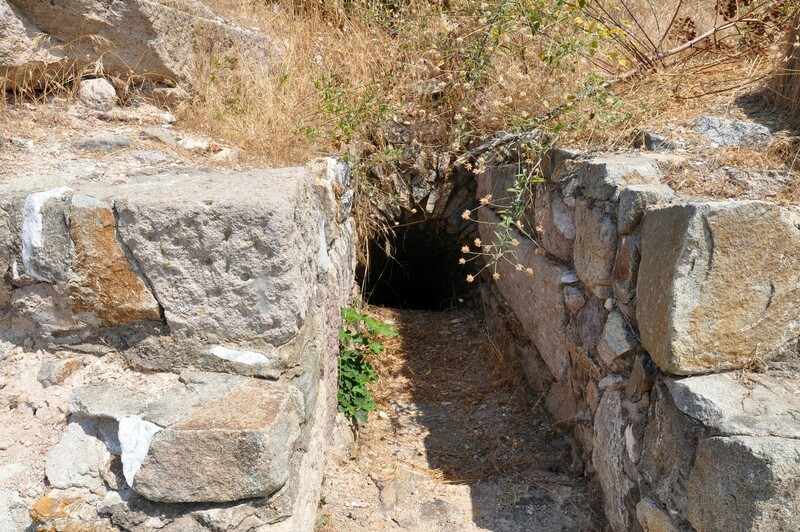 The entrance to Cyzicus ruins is free of charge. 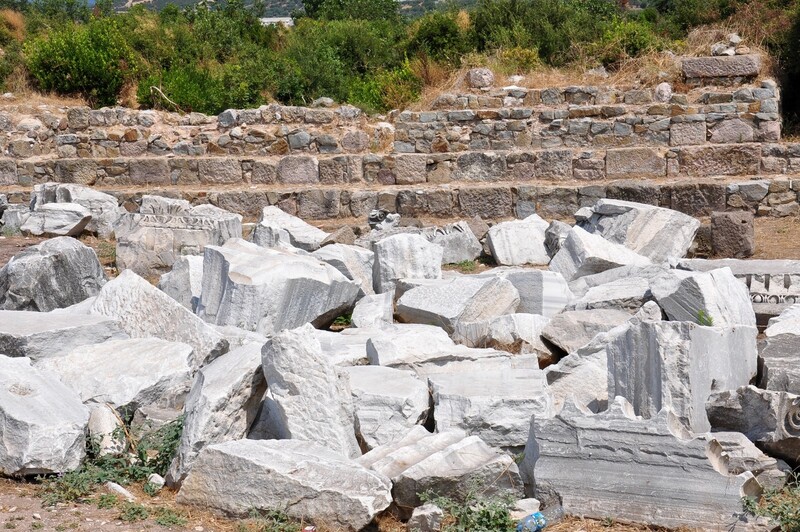 Currently it is an active archaeological site, thus it might be possible to ask one of the workers to show the most important parts of the ancient city. The area is heavily overgrown with trees and bushes so proper clothes are essential. The underground part of the city is inhabited by bats that get alarmed by the presence of visitors. By car: the ruins of Cyzicus are situated next to the Bandırma-Erdek road, 7 km to the south-east from Erdek and 13 km north-west from Bandırma. The turnoff to Cyzicus is signposted only once and may be easily overlooked.